Insectoid Dronons have slain the queen Semarritte, throwing into chaos the ten thousand worlds over which she reigned. Desperate to save mankind, Lord Veriasse, Semarritte's near-immortal consort, has created a new queen: Everynne, cloned from her dead mother. Born to rule, Everynne instead is on the run, often only one planet ahead of advancing forces of the invaders, who recognize that Everynne is a powerful rallying point for threatened humanity. Hotly pursued by the dronons and their armed forces, the Vanquishers, Everynne falls in with cocky bodyguard Gallen O'Day; the pious Orick, an intelligent black bear; and the beautiful orphan, Maggie Flynn. With these new allies sworn to her service, the young queen begins the great struggle against the aliens. Leaping from world to world via an ancient system of instantaneous transport gates, the heroes face terrible dangers and great wonders as they seek the heart of the Dronon worlds, carrying the battle straight to the enemy. ©1994 Dave Wolverton; (P)2009 Audible, Inc. I thoroughly enjoyed The Golden Queen. It had the winning combo of an interesting and varied setting, fascinating three-dimensional characters and a captivating storyline. Perhaps it was having a bear as one of the main characters but I found the story reminded me of The Golden Compass. I also found the narration very well done. The varied accents of the narrator made it easy to keep the characters apart without being over stated or distracting. An overall well done reading/listening experience. Is THIS first book in the Golden Queen trilogy more of the same? I am happy to report that it most definitely is just that - An engaging, solid noteworthy first of three books. 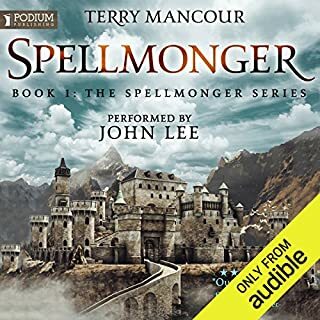 This audiobook will capture your imagination, and actually trick you a bit. At first, you'll be completely convinced that it's a fantasy novel. Later, you'll realize that it's actually high scifi. What begins on one world and its diverse peoples and animals (talking bears, for instance), quickly moves to gateways between worlds and human and insect galactic civilizations at war. There are heroes, heroines, anti-heroes, twists, turns, plots, discovery, and ultimately enjoyment. I found myself easily pulled into this broad, sweeping epic, and when that happens, the author has achieved his or her desire - The reader has been pulled into a world totally designed by the author, and in doing so, suspends reality in lieu of the story. 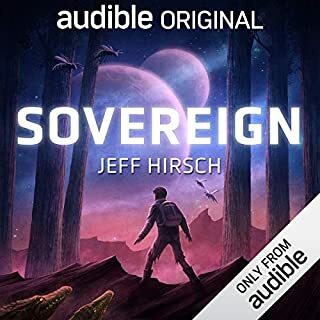 I liked this audiobook very much, and recommend it highly to you, my fellow Audible listener. Step forward through the gate, and begin your journey. Not good/not bad just average. Story is a decent mix of sci-fi & fantasy. The problem is sometimes it drags on and I would lose interest, and other times was quite entertaining. The overall result is just okay. Also, the reader is somewhat drab which does not help. I did enjoy all of the different characters/villians in the book. That being said, the second book in the series is just AWFUL!! Not sure how I made it all the way through, and tuned out large sections while listening. 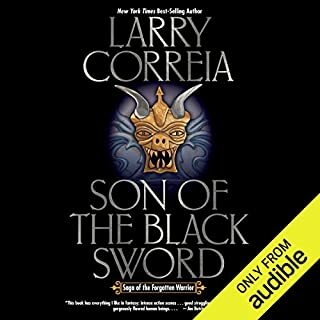 It is to this date the only audiobook I have ever returned for a credit and I only paid $4.95. THE MAN IS SO CLEAN, IF YOU TOOK A BATH WITH HIM, YOU COULD USE HIM FOR SOAP. IF SOMEONE LOOPED OFF YOUR HEAD, IT WOULD BE NO LOSS, YOUR GONADS WOULD DO ALL THE THINKING. When this story starts out it, sounds like an amusing fantasy. It is funny and you meet some interesting characters, but before you get a chance to explore what seems to be an interesting world, we change worlds. The book goes from fantasy to Sci-Fi. 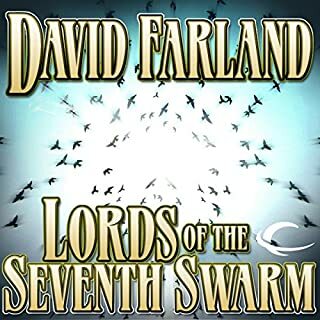 The Science has lots of genetics, human sized insects, mind control, robots, etc..
Farland who wrote this book originally under the name Wolverton does not write Science Fiction as well as he writes fantasy. Though he has lots of gadgets and he explains them, it just does not come off as believable. He should have stuck to fantasy and explored the first world more completely before changing gears. It was an early novel and it reads like an early novel. 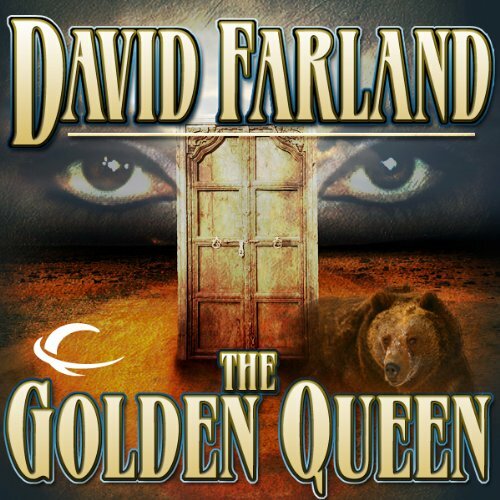 Under the name Farland, he seems to write only fantasy and he sells more books. He is creative and has talent in writing fantasy. He also has plenty of cool one liners, as witness above. The narrator does not help, his voice is too sweet and sounds like he is reading Dr. Seuss. GOD, BE WITH YOU, FOR I SHALL NOT. What did you love best about The Golden Queen? The plot and the characters were awesome! He's not bad, I read this book my senior year in high school 2002 and fell in love ever since! The other worlds and the wars there of! Classic!!!! Not enough credit given!!! 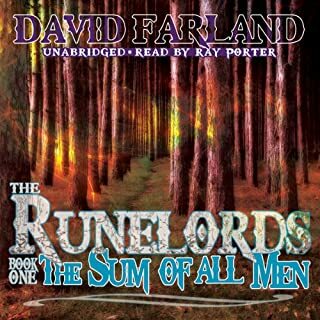 The Runelords saga, by David farland, is my favorite series of all time. I saw this series by the same author, and got excited. after finishing the first book, I find myself disappointed. it's ok, it's definately original, but the world just doesn't pull me in. the world is almost too different. ir doesnt make logical sense. iwould recommend it, but it's not gonna set the world on fire. it's merely ok. I was enjoying this book by one of my favorite authors up to the point where he introduced the word "sidhe." The narrator, who otherwise does a reasonably good job with the nonstandard-English words mispronounced it, and continued to do so. Had the word been used infrequently, it wouldn't have been so annoying, but constantly hearing "sid-he" instead of "shee" just got to be too much. If you have Kindle, I highly recommend getting the ebook version instead. The main characters of the book are Gallan, Maggie and Orick, the talking bear. They are going about their daily business when two strangers enter their lives, Everynne and Veriasse. Everynne is the clone of the queen who had ruled 10,000 worlds until she was killed by the Dronons who then took over and she and her bodyguard are trying to regain control since the Dronons are not very nice rulers. Gallan, Maggie and Orick join in to help. They start hoping different worlds through gates and have all kinds of adventures, sometimes together, sometimes separately, until they get to the final showdown. I started out getting caught up in the story, but at other times my mind would wander until it got interesting again. There's plenty of fighting since they're on a mission, of course. You get to hear about the different worlds they go through to get to their final destination. Plus there's a little romance thrown in. I thought the narrator did a great job on the different characters. I couldn't figure out WHAT I was listening to. I wasn't sure if I was reading about ants or humans, or just what.... 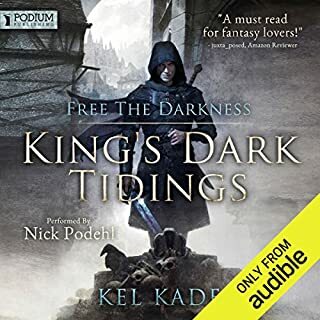 These audio books were inexpensive and I bought the series. When I run out of things to listen to I'll try them again, but I canned this book within minutes. This book started off really interesting. I was enjoying the story up until the point that they started travelling through space and the author started explaining the science behind things. Yawn! I made the mistake of thinking that this was fantasy....and the first quarter of the book was. My mistake for not know that David Wolverton writes both fantasy and sci fi under the same nom de plum.